We also price match on CM650WX and CM650W plus CACVPPAC1 Upgrades. Brother Top of Line ScanNCut2 model CM650 are the only ones with 24x12" Scan and Cut capabilities. includes an additional 125 Designs plus enhanced image tracing! The CM650WX includes 2 activation cards: 125 designs plus Enhanced Image Tracing. The CM650 (SNC2) has NOT CHANGED. The only thing different is that instead of the book coming free with the CM650WX it now has the 2 activation cards for the designs and tracing feature. The Premium Pack is an exclusive Dealer Only Product for one year. The CM350 has to have the wireless card to work with the Premium Pack. Brother will soon upload the Enhanced Image Tracing videos on how to activate 125 designs via ScanNCut Canvas Workspace to our social sites. Note that Face book groups have been very confused and stating that some dealers have informed them that this new model CM650WX includes Disney designs. We did introduce the Disney images available for the SNC2 but this is a separate purchase Here! We Match Our Competitor's Prices For the same CM650WX without our extras, other than built in designs! Call 800.739.7374 for More Information. Thanks. 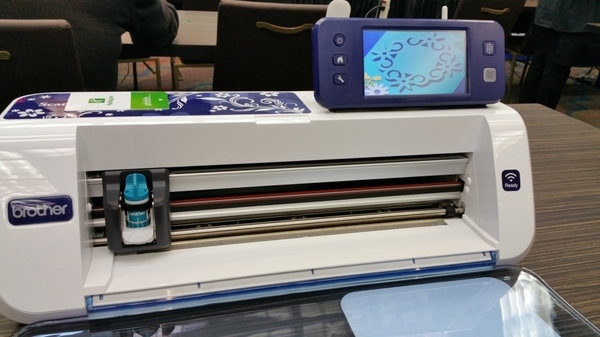 Brother Top of Line ScanNCut2 model CM650WX is the only one with 24x12" Scan and Cut capabilities. 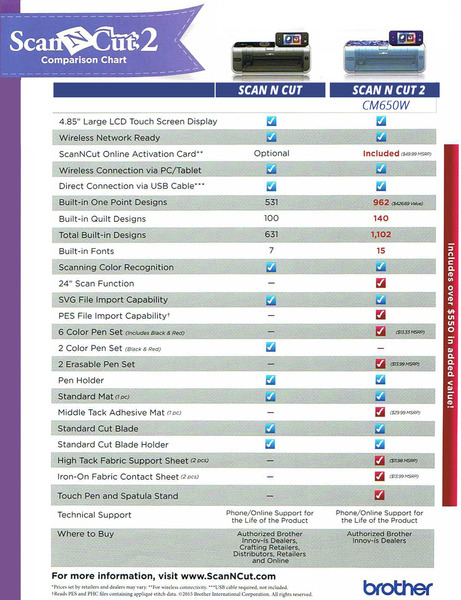 All other ScanNCut models are only 12x12" Scan and Cut capability which can be very frustrating to customers. The 24" long mat can only scan one half the length of the mat, on model numbers lower than CM650WX. • Ability to scan 24"
The new Brother Scan N Cut 2 CM650WX now comes with a bigger color touch screen, 12x24" scanning field and wireless functionality. 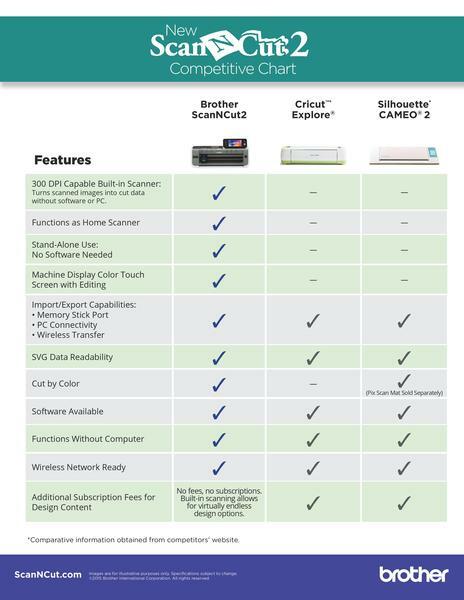 The secret to ScanNCut’s amazing versatility also lies in the 300 DPI built-in scanner, making ScanNCut the only cutting machine that can take your scanned images, photos or hand drawn sketches, and turn them into unique cutting designs and data, without the need or expense of a computer, software, or pricey cartridges. The NEW CM650WX ScanNCut 2, the worlds first home and hobby cutting machine with a built-in scanner, giving you the ability to scan almost anything you can get your hands on and place into the machine to cut out. Developed with the advanced, cutting-edge technology that Brother is known for, this machine is truly an incredible innovation in electronic cutting machines. The new Brother Scan N Cut CM650WX now comes with a bigger color touch screen and wireless functionality. 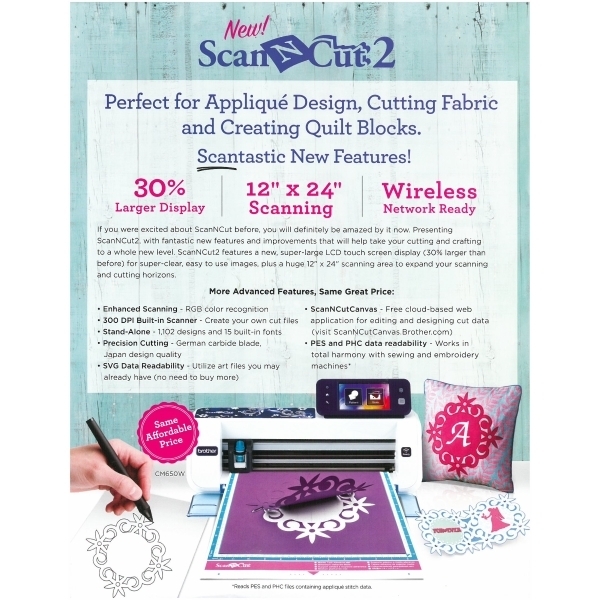 Scantastic Features on ScanNCut2. See it. Scan it. Cut it. Create it. All you need to know from techniques to maintenance. 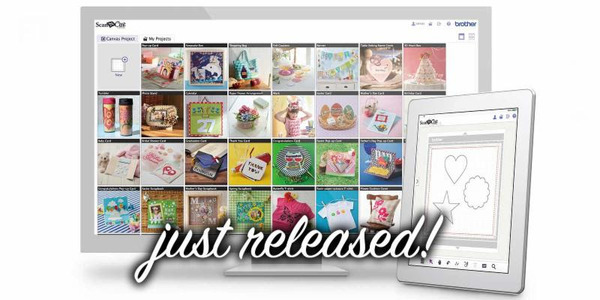 ScanNCut Projects ArchiveFrom beautiful wall decor, to intricate greeting cards and scrapbook pages, your creative possibilities are virtually limitless with ScanNCut! We invite you to explore our project archive where you will have the ability to view and download step-by-step projects created especially for you by our educators and affiliates! We have released a new version of ScanNCutCutCanvasWorkspace. Tablet and smartphone friendly, please refer to the help document on ScanNCutCanvasWorkspace for a list of compatible devices. On-the-go editing! Transfer files via the ScanNCut Online feature available with ScanNCut2 (activation card required). 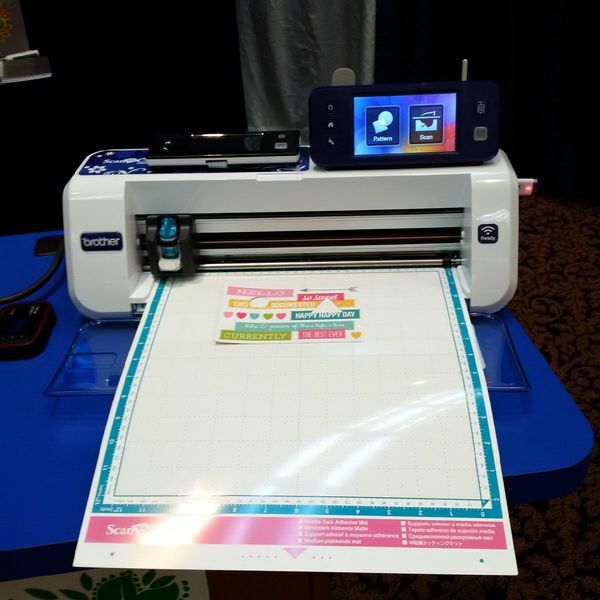 The world’s first home & hobby cutting machine with a built-in scanner. No more design cartridges or dies needed. Unboxing and Getting Started with ScanNCut. 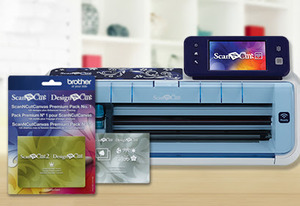 From opening the box through to getting ready to start crafting, Brother consultant Julie Fei-Fan Balzer explains each item within your ScanNCut box as she unpacks it. Now work with CanvasWorkspace offline with the new PC-Based Software. Create and edit cut files, access FREE templates, perform image tracing and more. CanvasWorkspace PC-Based Software is compatible with all Brother cutting machines. Now Available for Download! 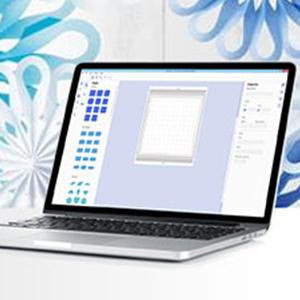 CanvasWorkspace is a new PC-based software that combines the versatility of your favorite design software and the power of your Brother cutting machines, giving you the ability to create unique cut files and more. Q: Which models does the universal pen holder work with? A: The universal pen holder works with all ScanNCut and ScanNCut2 CM650W models. Q: Is the touch pen & spatula stand available as an accessory for my current ScanNCut machine? A: No. 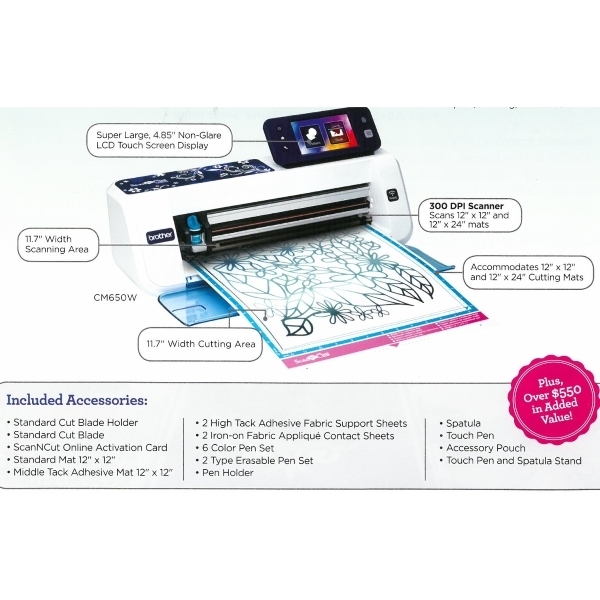 The touch pen & spatula is only available with the ScanNCut2 CM650W/X models. Q: Can the ScanNCut Online (WLAN) activation code be used multiple times? A: The ScanNCut Online (WLAN) activation code can be used for 1 SacnNCUt2 machine. Please be sure to keep your activation card in a safe place in case you need to reference the 16 digit-code again. Q: Can the ScanNCut Online (WLAN) activation code be used with previous models of ScanNCut machines? A: No. The previous models of the ScanNCut machine are not wireless network ready. 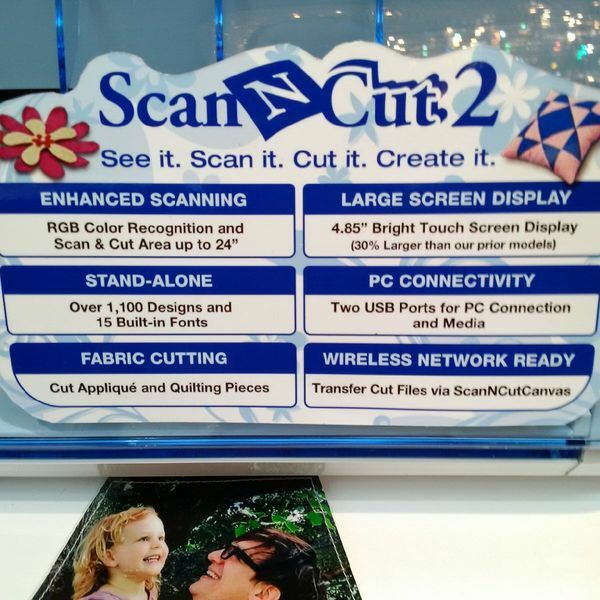 The activation card can only be used with ScanNCut2 models. 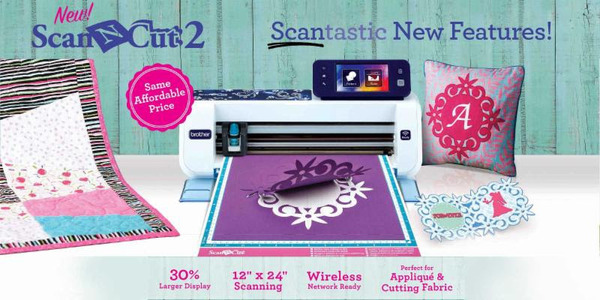 Q: Can I use multiple ScanNCutCanvasWorkspace accounts wirelessly with my ScanNCut2 machine? A: Only one ScanNCutCanvasWorkspace account can be tied to the machine and be used at one-time. However, you can alternate between ScanNCutCanvasWorkspace accounts. Please refer to the Wireless Network Guide for more information. Q: How do I save my .PES/.PHC file for use in the ScanNCut2 machine? A: Please make sure your file contains applique stitch data. Not all ScanNCut and ScanNCut2 models read .PES/>PHC data. Specifications vary by model. Q: When I import an SVG design into ScanNCutCanvasWorkspace with very small elements, the smallest elements, disappear when I save the design to an FCM file. How can I make sure that they are included with the rest of my design? A: The reason this is happening is that ScanNCutCanvasWorkspace will remove tiny design elements to ensure better cutting quality on the ScanNCut machine. So first determine if you really need those elements in your design as they may not cut well. For example, one reason you may want to keep them is if they are meant to be drawn, not cut. If that is the case, then simply enlarge the overall design in ScanNCutCanvasWorkspace before saving to an FCM file. You can reduce the size again after you have loaded the design on the ScanNCut machine.